Proof that Tiger Woods moves the needle in golf was evident again as his 18th hole rules controversy overshadowed leaders Jon Rahm and Henrik in the $3.5m Hero World Challenge in the Bahamas. It took a super slow-motion replay to reveal he had almost scooped his escape back into play as he dropped to his knees to extricate his ball from a bush. In the end, the tournament host finished with a double-bogey six for a 69 that left him tied for 14th in the 18-man field on two-under. But it took officials over 15 minutes to determine that Woods deserved no penalty under Decision 14/3, which governs infractions that come to light only through the use of sophisticated technology. "I didn't feel like I violated any rules, but the rules official pulled me aside and said, 'Hey, there may be a violation there,'" said Woods. "We took a look at it. They were in the truck watching it, trying to determine whether or not I had hit the ball twice. I didn't feel like I hit it twice. It happened so fast and was such a short motion. "But under high-def and super-slow-mo you can see it, I made contact twice. … There is no violation, I guess, so I shot what I shot today." Rules official Mark Russell said: "Tiger didn't think he hit the ball twice and it was not discernible to the naked eye. "We had to look at high-speed, slow-motion video to determine that the ball probably did stay on the clubface a little too long. "But there was no way he could have known that, and with this new decision there is no penalty." Meanwhile, Gavin Moynihan refused to let a late monsoon dampen his mood as he carded a sweet 65 to soar into contention for the AfrAsia Bank Mauritius Open. The man from The Island drove the ball brilliantly and holed out clinically inside 10 feet to go into the weekend in fifth place, four strokes behind American Kurt Kitayama on 10-under par. "The driver is the key at the minute," said Moynihan (24) after making eight birdies in a sparkling seven-under-par effort at Four Seasons Golf Club at Anahita where his only bogey came at his 17th hole as an afternoon downpour soaked him. 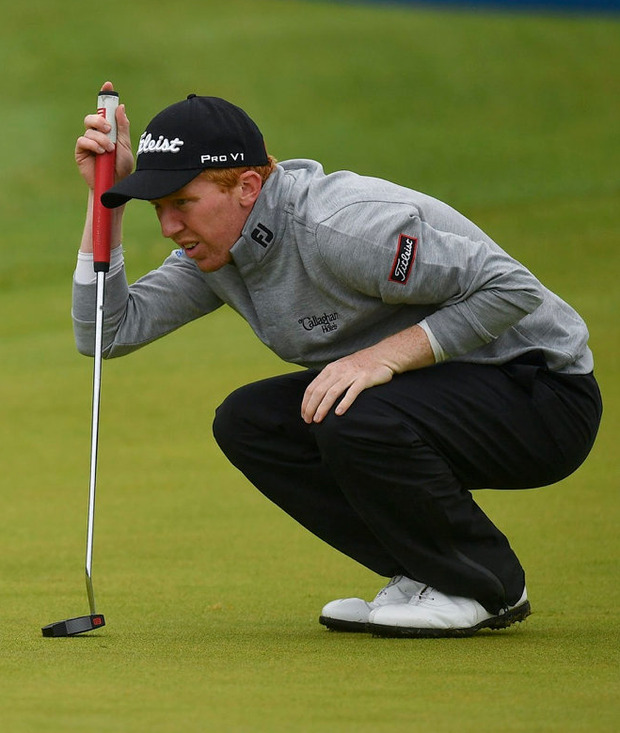 Muskerry's Niall Turner bogeyed the 16th and 18th to miss the level par cut by a shot after a 73 while Michael Hoey, Cormac Sharvin and Robin Dawson were also cut in the Australian PGA Championship. Des Smyth leads the Irish challenge heading into the final round of the Staysure Tour's Costa Blanca Benidorm Senior Masters, eight shots behind leaders Rafael Gomez and Paul Streeter after a 71 left him tied 25th on one-under. Paul McGinley (72) is a shot further back on level with Brendan McGovern (68) one-over, Eamonn Darcy (77) six over and Philip Walton (75) eight over. Meanwhile, Pádraig Harrington paid a heartfelt tribute to the late Irish Independent golf and rugby correspondent Colm Smith yesterday. "So sorry to hear of the passing of Colm Smith," Harrington wrote on Twitter. "He was such a positive influence on my career and a good friend. He will be great missed but not forgotten. RIP Smithy." Mr Smith, who passed away yesterday after battling ill health in recent years, covered Harrington's career from his early days as a promising Boys international through to Walker Cup, Ryder Cup and Major championship glory. On Harrington's 3&2 defeat to Darren Clarke in the final of the 1990 Irish Amateur Close: "He denied young Pádraig Harrington from Stackstown the honour of becoming the first teenager since Ronan Rafferty in 1980 to hold the title, but this 18-year-old Dubliner has won a lot of friends through the past few weeks and, with his kind of talent, he has a very bright future indeed."